Jumpstart gets your dead battery going again with 250 cold cranking amps. Reverse polarity indicator ensures correct hook up. 260 PSI air compressor inflates the tires without effort. 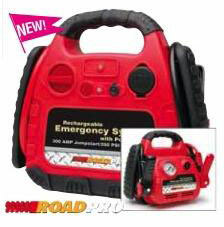 Sealed lead acid battery can be recharged at home or in your vehicle with included adapters. Convenient charging indicator; Red when charging, Green when fully charged. High impact rubberized housing for safe secure grip. LED battery level indicator. On board outlet for powering your 12-volt devices with short circuit protection. Safety on/off switch. Includes power adapters and inflator nozzles.